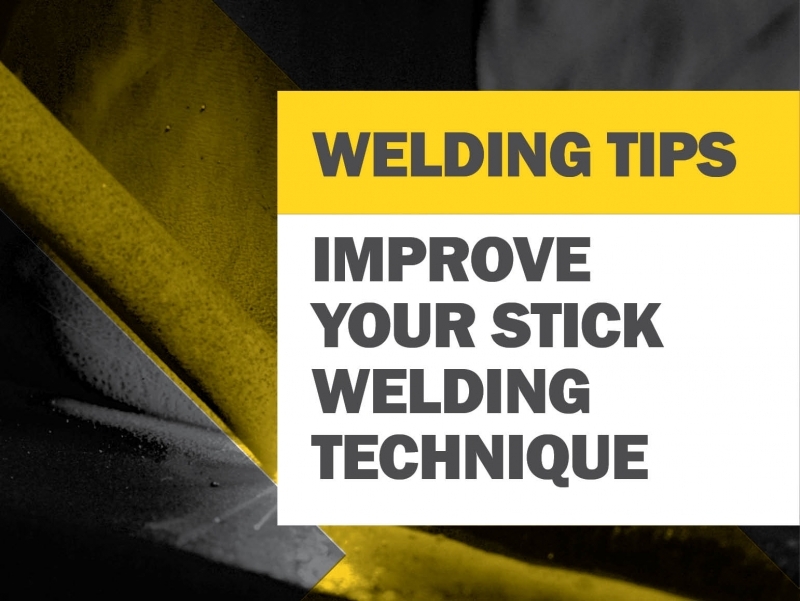 Stick welding can be a hard process to learn as there is an array of issues that could cause problems. But don’t despair. There are techniques that can make the process easier. Known as CLAMS – Current setting, Length of arc, Angle of electrode, Manipulation of electrode and Speed of travel – these procedures are straightforward to learn, will improve the weld and ensure the job is completed properly. However, before laying down these techniques, the surface has to be prepared properly, which includes making sure that the workspace is clean. It also means that the surface of the metal being welded must be grit-, dirt- and rust-free. If it is not, the weld will probably crack, which means the job will be ruined and the only option will be to start again. Positioning of the body is a key consideration, too, as well as keeping clear of the smoke produced by the weld and having a good view of the weld puddle. The selected electrode will determine whether a machine should be set up in AC, DC negative or DC positive. It is best to select the amperage being used based on the electrode, welding position and visual inspection of the finished weld. If the finished weld is poor, then one of these settings could be the problem. It is important to adjust the welder by 5 to 10 amps at a time, until a suitable setting is found. If the amperage is too low, the electrode will start sticking when striking an arc. If the amperage is set too high, glitches can appear that include the puddle being excessively fluid, the electrode charring when half of it is gone and an arc sounding louder than it should. Excessive heat can also have a negative affect the electrode’s flux abilities. A good rule of thumb is that a correct arc length will not exceed the diameter of the core of the electrode. Using a long arc seems natural because it helps the user see the arc and puddle. However, the user should position themselves so they have a better view of the arc. If a user’s body is put in the correct position, it not only gives a good view of the puddle it also helps to manipulate the electrode correctly. It is best to hold the electrode perpendicular to the joint being welded. This allows the user to tilt the top in the direction of travel about 5 to 15 degrees. For welding vertical up, use the forehand technique whereby the top of the electrode it tilted up to 15 degrees away from the direction of travel. Each welder should develop his or her own style by practicing and also looking at other peoples’ techniques. Any material thinner than 6mm means that weaving the electrode is unnecessary because the bead will be wider than needed. In many instances a straight bead is all that’s required. With thicker material, a welder can create a wider bead by moving the electrode side to side. This creates a continuous series of partially overlapping circles in a “Z,” semi-circle or stutter-step pattern. It is important to remember that the aforementioned side-to-side motion should be limited to twice the diameter of the electrode core. To cover a wider area, make multiple passes or use “stringer beads”. If welding vertical up, the focus should be on welding the sides of the joint, because the middle will take care of itself. Remember, when moving across the middle of a joint it is done at a pace that allows the weld puddle to catch up. Then pause at the sides to allow a solid tie-in to the side wall. If welds look like they have overlapped, then the user has gone forward too fast and didn’t hold on the sides as long as necessary. Finally, there is the speed of travel. This is a key ingredient to getting the correct weld. Your travel speed should allow you to keep the arc in the leading one-third of the weld pool.